As a track tractor owner, you will eventually have to replace a worn or damaged track. Did you know used Camso track carcass and wheel cores still have value? Similar to rebuilding an old engine, your track carcass and wheel cores can be remanufactured to OEM standards and perform like new replacement parts – all at a lower cost than a new system. 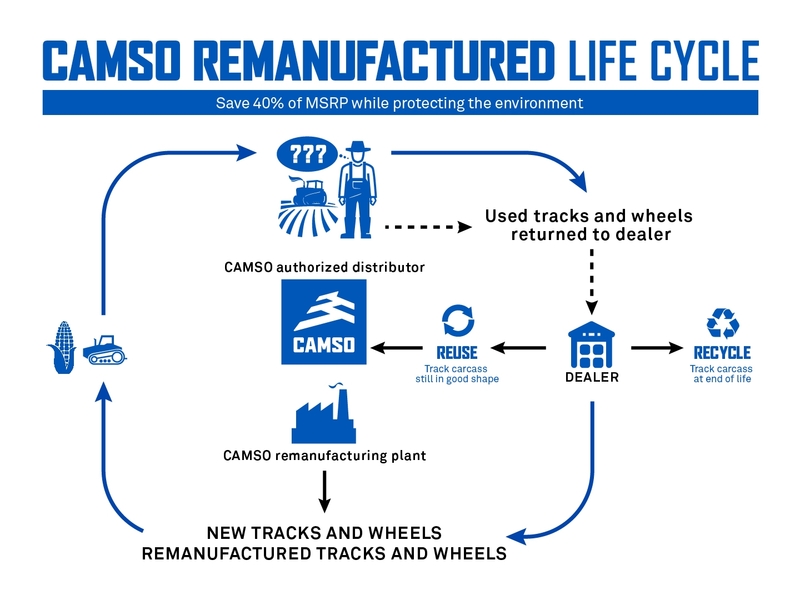 Camso’s certified remanufacturing program lets you return used Camso wheels and tracks to your dealer and eliminates the hassle and expense of disposing of them at a landfill. After hundreds or thousands of hours of dependable service on your tractor, your tracks will eventually become worn or damaged past the point of where it no longer makes sense to continue using them. Related article : When is it time to remanufacture your track and wheel? Before now, your only option was to order new replacement parts and dispose of the used parts in a landfill. Now, there is another choice. Instead of hauling used tracks and wheel cores to the landfill, you can now return these parts to your dealer and Camso can give them new life and put them back into service. It is possible thanks to Camso’s certified remanufacturing program. Remanufactured tracks and wheels provide an economical, effective and durable solution that extends the use of tracks and wheels on equipment far beyond what was once thought possible. In fact, tracks and wheels can be remanufactured up to three times and provide up to four lives of service. Once your tracks or wheels are worn to the point of needing replacement, contact your dealer. The dealer will contact Camso’s authorized distributor and determine if your tracks or wheels can be remanufactured. If approved, the used tracks and wheels will be remanufactured in Emporia, Kansas, in a dedicated new facility Camso opened in June 2018. It’s as simple as bring one in and get one. There are three ways to take advantage of Camso certified remanufactured tracks. One option is to return your used track carcass or wheel cores to the dealer, have the used parts remanufactured and then reuse them on your machine. Or, you can buy a new replacement part using credit Camso gives you for returning your used track carcass or wheel core. If you choose not to remanufacture your parts for your own use, simply return them to your dealer and Camso will give you credit toward the purchase of a new Camso track or replacement wheel. Another option is to buy a remanufactured part from inventory. In this instance, you can replace a part with a certified Camso remanufactured part that performs like new, but at a lower cost. In any case, your used track carcass and wheel cores have value if not completely worn. Remanufacturing used or damaged parts can change the way you buy and use tracks and wheels on your tractors. Now, you can think of a product that provides the lowest operating costs through its first life while considering the multiple lives it can deliver after its initial cycle. Camso certified remanufactured products have been shown to provide an economical, effective and durable solution for general AG applications that can extend the use of tracks and wheels on equipment. Remanufacturing is available for all 18- to 36-inch Camso Friction Drive Tracks. To give multiple lives to a product you’ve always trusted, call 1-844-CAMSOAG, email Ag.ProductSupport@camso.co or visit Camso.co for more details about the certified remanufactured tracks and wheels program. Learn more on our remanufactured tracks and wheels offering.